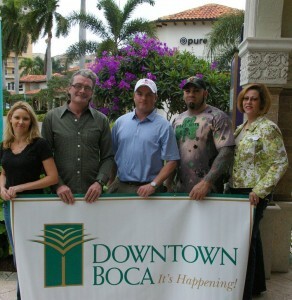 Downtown Boca invites families, area neighborhoods, country clubs and golf courses, schools and universities, community organizations, nonprofits and visitors to “rev up” their St. Patrick’s Day celebration on Saturday, March 17th by lining the streets for its First Annual “Off The Green” Downtown Boca Golf Cart Parade presented by Delray Hyundai-Delray Acura and held in conjunction with Festival of the Arts BOCA St. Patrick Day Extravaganza. Including several solar-powered carts featured by Shamrock GREEN Sponsor: the PGA Tour’s Allianz Championship, the free, family-friendly, open-to-the-public parade will begin at 12 Noon at Mizner Park Amphitheater (590 Plaza Real). 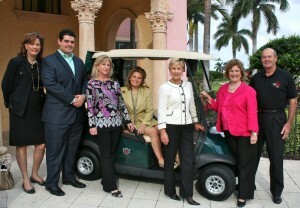 To showcase Downtown Boca’s great shopping, dining, cultural, entertainment and lifestyle offerings, the golf cart parade route will take the decorated carts all throughout Downtown Boca– through Mizner Park, across the pedestrian promenade and Sanborn Square, down Palmetto Park Road and around Royal Palm Place, with carts returning to Mizner Park Amphitheater for judging. Spectators can watch the festivities from Sanborn Square or from the official “watch spots” at Irish pubs and eateries in Downtown Boca, including Black Rose Irish Pub, Dubliner, Flanigan’s, Holloway’s, O’Brian’s, and Wishing Well. Organizations participating in the parade include Allianz Championship, Biergarten, Boca Raton Bridge Hotel, Boca Raton Travel, Broken Sound Club, Downtown Advisory Committee, Florida Atlantic University, GGP, Juicy Results, Palm Breeze Charters, Salon Monaco, Siemon & Larsen, Sol Children Theatre Troupe, The Spaniard Tapas Bar, and Tucci’s Pizza. A cash prize and “Irish Gift Basket” will be awarded at the conclusion of the parade at the Mizner Park Amphitheater clock tower to the most creatively decorated golf cart, as judged by representatives from local Irish establishments. At 1:30 p.m., free festivities courtesy of Mizner Park, The Dubliner and coordinating sponsor Festival of the Arts Boca will feature children’s activities and bagpipes. The Festival of the Arts BOCA St. Patrick’s Day Extravaganza at the Mizner Park Amphitheater begins at 3:00 p.m. with performances by the Drake Irish Dancers, fiddler James Kelly. Founded by Karl Drake, the Drake School of Irish Dance is one of the strongest schools of Irish Dance in the southeast, producing many regional and national champions as well as World Medal holders. Beginning at 6 p.m., the Festival of the Arts will present a free live concert by Celtic band Seven Nations. Premier seating is available: $20 for adults and $10 for children over 12 years old. Limited free general “on-the-lawn” admission is available for those who bring their own chairs or blankets. For more event information, visit www.downtownboca.org, www.festivaloftheartsboca.org, or www.mizneramphitheater.com.